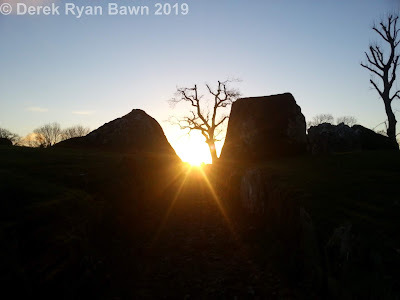 Was the stone known as Cloch a bhile at Lough Gur a symbolic echo of the world tree (as put forward by Michael Dames) or in reality was it an inauguration site of the medieval period? It could of course be both. 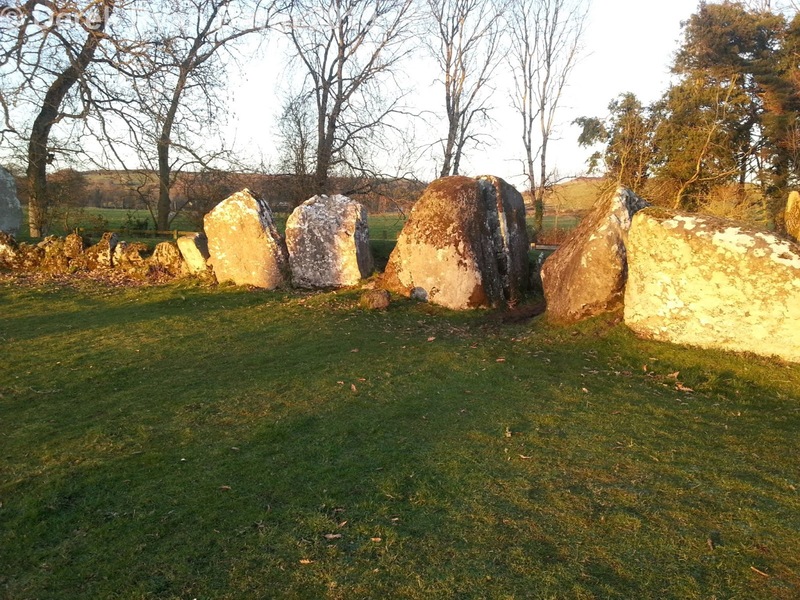 However in The Archaeology of Lough Gur pg 334, Rose M. Cleary argues that the Cloch a bhile may have been used as an inauguration site of Munster Kings and later the Fitzgeralds who along with legendary Gearoid Iarla became "more Irish than the Irish themselves". In 1573 Gerald fitz James Fitzgerald was released from jail following the 1st Desmond Rebellion in Ireland. He made a daring escape while under curfew in Dublin with the help of Rory Oge O'More and Piers Grace and returned to Munster. "On his return to Munster, Gerald received widespread support. 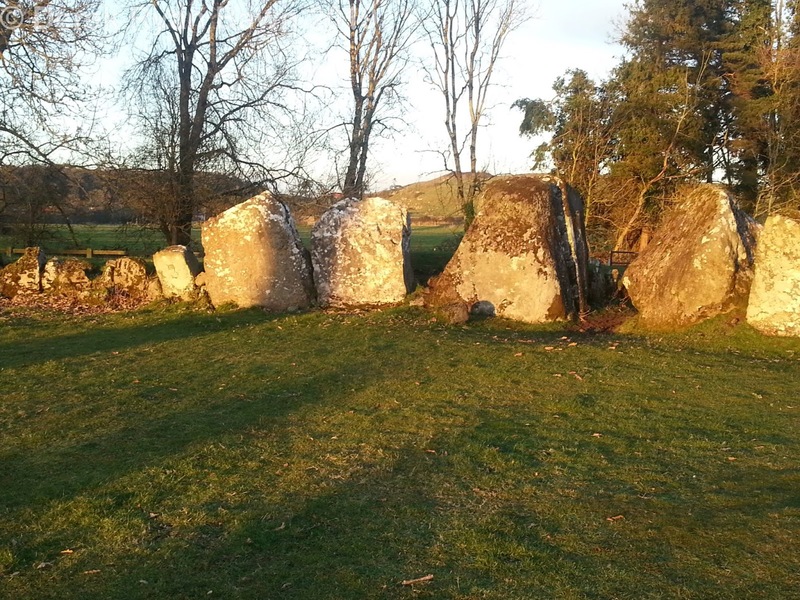 'His wife met him at Bealadrohid and they continued to Lough Gur' (McCormack 2005, 132). Edwards (2016, 342) records that when the earl arrived at Lough Gur 'he was greeted by an assembly of local landowners who gathered at the ancient inauguration site that stood close by', and that 'with great ceremony he removed his clothes he had worn since leaving Dublin, his "English apparel", and "put on his Irish raiment". The inauguration site may have been located at Grange, where Lynch (1895, 299) noted that 'an ancient line of Munster kings were inaugurated' under the tree near the standing stone at Cloghavilla." So there is record of this stone as being linked to the inauguration of local Earls or Chieftains and this is likely to have gone back to the previous Gaelic Chiefs of the area. "Cloch a bhile, 'The Stone of the Tree'. It stands two metres high, grey,runnelled and lichened, a reminder of the phantom tree formerly revealed beneath the lough at seven-year intervals. The stone is a permanent reminder of the ideal World Tree, for lack of which all the forests of the world fall into danger. In myth, the divine tree has the power to en-green the entire forest." 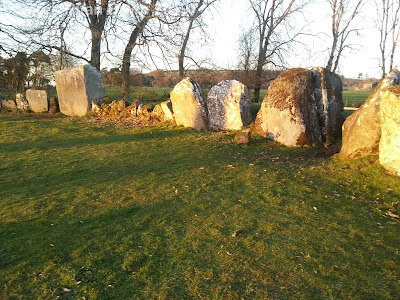 Now it does seem that there is folklore related to a tree under Lough Gur and Howard Golbaum on his wonderful website recorded the story in an interview with local man Tom McNamara in 1999. 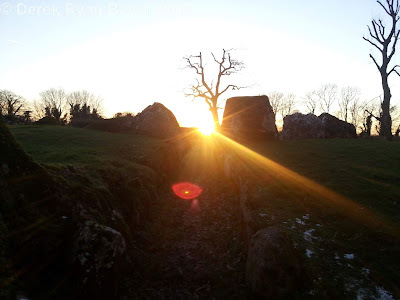 The Stone "is connected in myth to the magical tree growing on the bottom of Lough Gur, said to rise up to the surface once each seven years. Its moss and liche covered mantle gives it an organic appearance that resonates with the story of "The Green Cloak", as told by Tom McNamara." However I think there is a "jump" in linking this legendary tree under the lake to Cloch a bhile or Cloghavilla which may not necessarily be justified. I personally had always taken the account by Michael Dames of the myth surrounding the Cloch a bhile at face value (and passed on to many people) but I wonder now whether this was his own interpretation rather than something that was actually recorded in folklore in the area. I was treated to a beautiful near-Imbolc sunset at the Grange Lios or Circle B at Lough Gur in Co. Limerick. The Grange Lios is normally regarded as the biggest stone circle in Ireland and at Lough Gur is one of the most interesting and impressive megalithic landscapes in the country. I also discovered something very interesting from my observations - on the cross quarter day the shadow of the "horned" stones that mark the cross quarter, slowly cast a shadow that almost ends up touching the "entrance" stones. It didn't touch them exactly as the tree and the house were in the way but may have done so in antiquity. The cross-quarter sunset was first proposed by famous archaeoastronomy Boyle-Sommerville who was a cousin of Windle who carried out a survey of the antiquities in the area in the early 1900s. 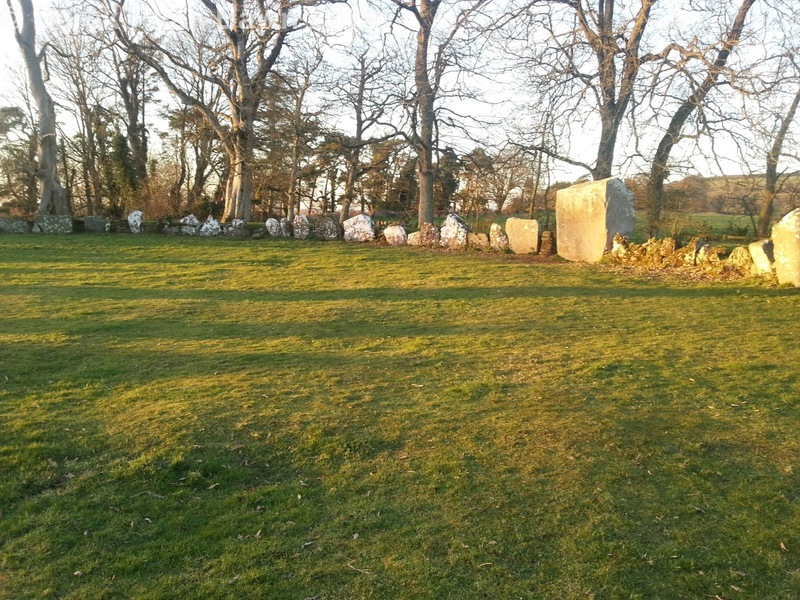 The shadows of the horned stones creeping across the circle towards the entrance. Link to my original post on facebook. The walk out to the the Millenium Cross near Portroe in North Tipperary is probably one of the best kept secrets in the county if not the country. 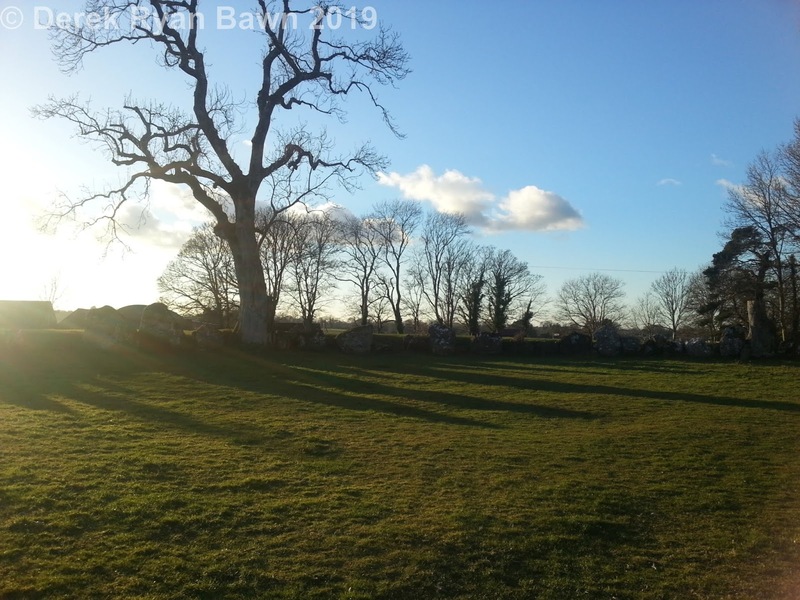 Not only do you get wonderful views over Lough Derg into County Clare but unbeknowst to most people, you also walk through one of Bronze Age Ireland's most interesting and enigmatic monument types, the hill-fort. The hill-fort here at Laghtea was only discovered in the 1990s from aerial photographs as it is not immediately obvious from the ground. "situated c. 10km north-east of Killaloe on the northern foothills of the Arra Mountains around the summit of Laghtea Hill, about 1.6km north of Tountinna, the highest peak in the range. 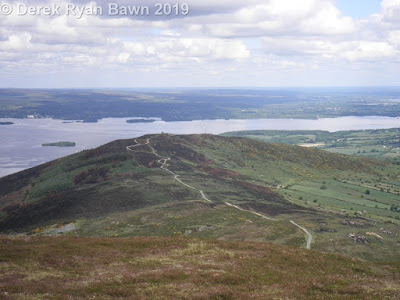 Laghtea Hill itself rises to a height of 1088ft, from where there are extensive views over Lough Derg to the north and west and over the valley of the Nenagh River to the north-east. The ridge of the hill runs in a line roughly north-south with smooth but steep slopes on the west, north and south. The eastern side of the hill is defined by steep cliffs and crags. 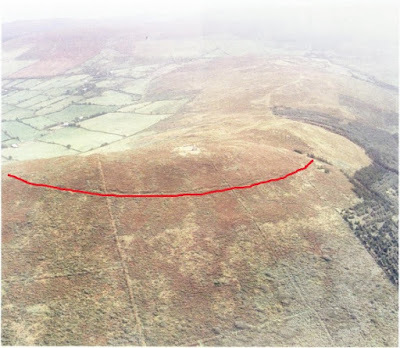 The hillfort located in the townlands of Laghtea, Cloneybrien and Townlough Upper, consists of a single enclosing element which is clearly traceable on the north, west and south running along the contour of the hill at about 900ft. The rampart could not be identified on the eastern side of the hill where the hillslope consists of a series of bluffs and crags. There is no evidence to suggest that this side of the hill was ever enclosed. The rampart consists of a double bank with an intervening ditch measuring 7-8m wide. The ditch, c. 2.5m wide at the bottom, is grass covered. The outer bank stands c. 0.5 m high from the bottom of the ditch and is c. 2m wide at the base. The inner bank, on average c. 2.5m wide, stands up to c. 2.5m high from the bottom of the ditch and c. 0.7m above the inside. For the most part the entire rampart is covered by peat and furze, while the ditch, which was dry at the time of inspection, was visible as a grassy track running through the furze. Where the hillfort rampart returns eastwards at the north end of the hillfort the possible remains of a circular platform (c 20m diam.) can be traced. The presence of this enclosure is detectable under more verdant furze growth. Within this there is evidence for the existence of a well with stone surrounding its edge. 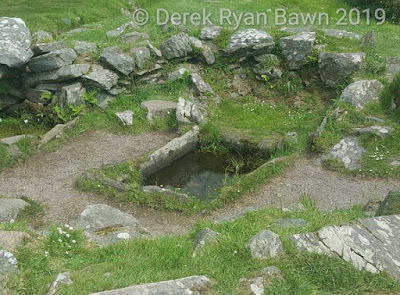 It is difficult to establish the exact relationship of this circular platform with the hillfort enclosure but it would appear to be at least contiguous with the hillfort rampart." The likely translation of the placename Laghtea is Leacht Aodha or grave or burial of Aodha / Hugh. Who this person was is not recorded but you would wonder is that any reference to the circular platform mentioned in the archaeological description above . Other monuments in the vicinity of the hill-fort that could be of a similar age are The Graves of the Leinstermen (possibly the remains of a court-tomb) and The Capstone of the King of Leinster which could be the remains of a cairn of some kind. Another interesting monument on the slope of Laghtea hill-fort is St. Patrick's Stone which has some great folklore associated with it. Also somewhere in the vicinity is Fert Fintan which is thought to have been located on the nearby Tountinna. A concrete cross was built on the summit of Laghtea hill in the 1930s and a few years later it was hit by lightning and fell. For the Millenium in the year 2000 a new mental cross was built and a track-way was created out to this new cross. 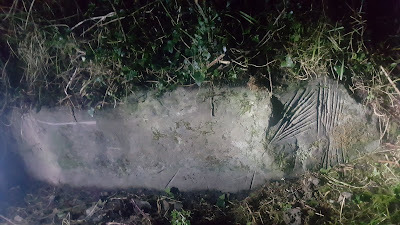 Despite all this work there have been no reports to my knowledge of any finds from the hill other than at The Capstone of the King of Leinster and this dates back to the 1800s. So what exactly is a hill-fort? "used as a fortified refuge or defended settlement, located to exploit a rise in elevation for defensive advantage. They are typically European and of the Bronze and Iron Ages." However the narrative around hill-forts has changed and certainly a one size sits all approach doesn't seem to be applicable now. Recently they have been linked with the major change in society during the Bronze Age, namely the creation of metals. In the Neolithic there may have been perhaps a class of people that were involved in rituals surrounding burials and megalithic tombs. However they do not appear to have achieved a higher economic or material status than the average Neolithic person. This you could argue changes with the introduction of metal-working in the Bronze Age. It may have helped with specialisation and with the creation of a class of artisans and other workers in the extraction of raw materials for the production of metal. These raw materials necessary for the production of metal were generally not all located in the same region and so sea-faring traders all arose to facilitate the supply of these. Lastly it could be argued that it also helped create a warrior elite. It is suggested in a paper from 2015 called “The Political Economy and Metal Trade in Bronze Age Europe: Understanding Regional Variability in Terms of Comparative Advantages & Articulations” that regional advantages, in terms of the types of metals that are geologically in a given location and then the bottlenecks in transporting that metal or finished metal product, allowed this new class system to emerge. For example in Ireland there seems to have been sufficient indigenous copper for the production of bronze but a scarcity of tin. Therefore whoever controlled the trade of tin into Ireland could create wealth disproportionate to its actual worth. Simply put whoever had access to ships or marine skills may have been able to bring tin over to Ireland and create a monopoly. This creation of wealth then allowed them to employ (or become patrons to) artisans to make the large variety of bronze items such as swords, axes, shields, jewellery and tools found in Ireland and also Europe from Irish sources. This it could be argued allowed these trading elite to attain more wealth as they now had a monopoly on “violence” (producing the weapons). The paper also talks of other bottlenecks that could be manufactured in regions such as the control of waterways or ports. The simple physical control of routeways, again by the treat of physical violence through having a well armed warrior elite, could create such a bottle-neck. Even areas that did not have natural metal resources began to exhibit similar structures as larger scale exploitation of local resources such as fur or amber in Scandinavia in an effort to attain these metals by trade. This increased wealth and creation of leaders seems to have led to physically different settlements in Ireland – namely hill-forts. These hill-forts may often have controlled one of these bottlenecks. This is where we get back to Laghtea hill. It has commanding views of the River Shannon and particularly the sheltered Youghal Bay and may have helped create a bottleneck here where raiding / taxing of boats took place. From here there are three hill-forts that may possibly control the west to east trade through the Slieve Feilim Mountains (from the Shannon) so it is interesting to test the hypothesis in a local context. These hill-forts are thought to have been lived in or at least owned by the warrior elite. 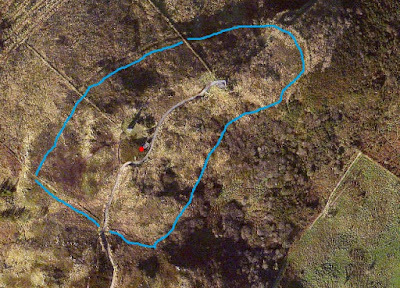 What is also interesting is that the Laghtea / Cloneybrien area remained associated with mining right up to the present day with the slate quarries. 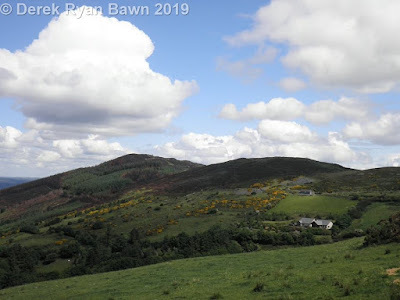 There has been suggestions that other forms of mining took place in the vicinity and also nearby at the Silvermines with "old-men workings being found at both". Its amazing what stories you come across randomly, like this one about plans to build a replica of the above Warwick Castle outside Thurles at a place called Brittas. It seems that there was an original castle here that was burnt down around 1820 and that the landowner, Major Henry Langley, then intended to build a full scale replica of Warwick Castle in it's place. Work was started but was abandoned in 1834 when Major Langley was struck by a stone on site and died. What remains on site are the uncompleted works and a residence has now been built on the site of the castle. Some more photos of the uncompleted works here. Such a pity that it wasn't completed, it would have been an amazing sight in the Irish countryside and surely a big tourist attraction for the area. "Warwick Castle is a medieval castle developed from a wooden fort, originally built by William the Conqueror in 1068. Warwick is the county town of Warwickshire, England, situtated on a bend of the River Avon. The original wooden motte-and-bailey castle was rebuilt in stone in the 12th century. During the Hundred Years War, the facade opposite the town was refortifed, resulting in one the most recognisable examples of 14th century military architecture. It was used as a strongbold until the early 17th century". Please note the remains that do exist are on private property and are not viewable from the roadside. One of the biggest discoveries I've made in the last year or so was the rediscovery of St. Patricks fingers on a stone near a holy well in North Tipp. These carving may in fact relate to sword sharpening and this has been linked to inauguration ceremonies for local kings / chiefs. I originally came across a reference to them via a facebook friend online in the Irish Folklore Commissions manuscripts. 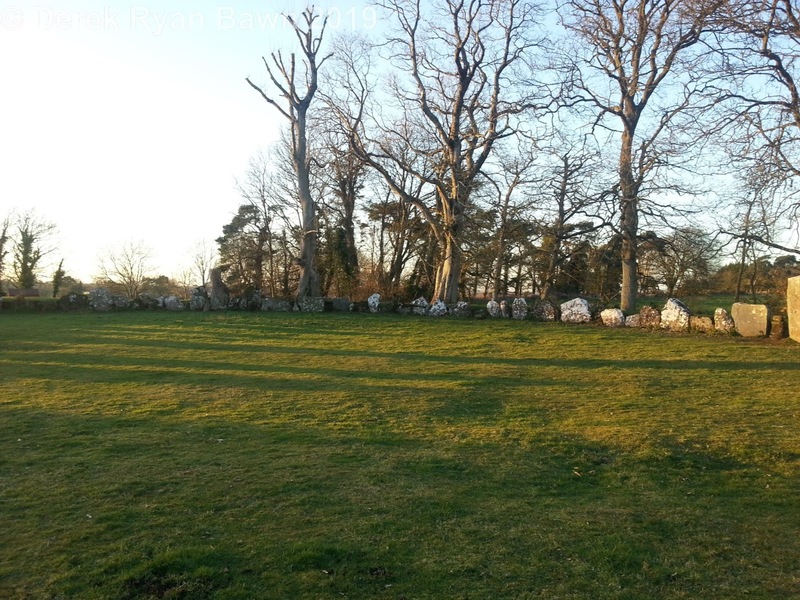 Last August I did a talk on Rock Art in Tipperary in Portroe in which I mentioned St Patrick's fingers and a local man came up to me afterwards saying that he knew where they were located. It was not till January of this year that we got a chance to look for them and he and another man kindly showed me where they were. (Thanks to these two men for their kind help) It has since been added to the SMR under the following description. 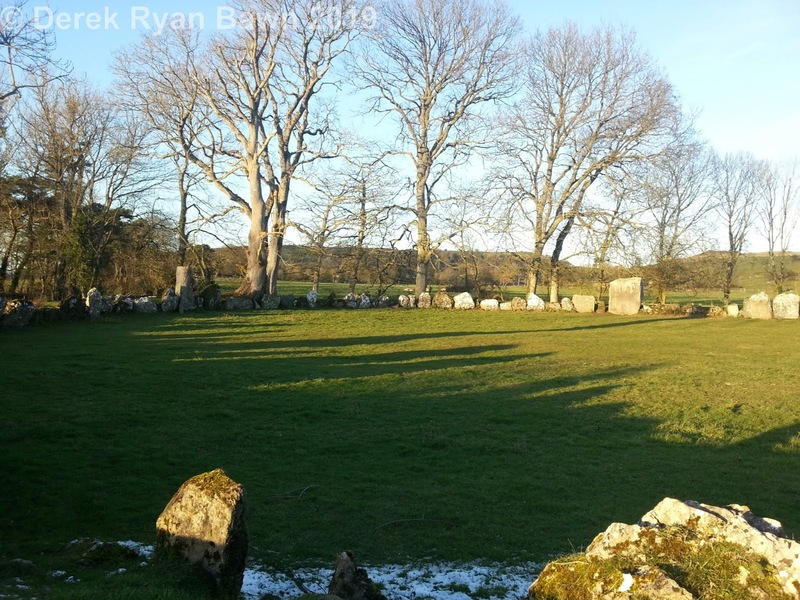 "Situated on W side of road 25m SW of St. Patrick's Well (TN020-056----). Large roughly rectangular-shaped stone (approx. dims. L 1.65m; H 0.5m) known locally as St. Patrick's Stone set on edge and incorporated into the roadside boundary hedge on W side of public road opposite St. Patrick's Well (TN020-056----). The exposed surface has numerous deep vertical lines (L 0.25m x D 0.03m) cut into the surface of the stone and along the edge of the rock at the top and at the bottom. This rock appears to have been used as a sharpening stone, the dating of which is uncertain. The cuts are similar to cut marks found on stones associated with megalithic monuments in France where they are referred to as 'Le Polissoir' (the polisher) and elsewhere as 'Grooves' and 'sword sharpening stones'. 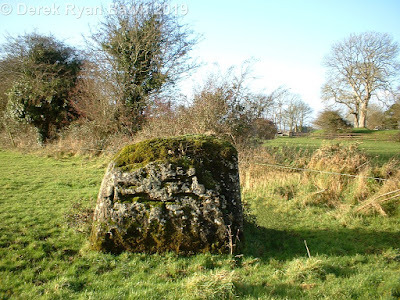 In 1938 the following folklore regarding this stone was recorded in Carrick National School; ’At St. Patrickswell in the townsland of Ballywilliam in the Parish of Youghlalarra is a stone on which there are marks. I (the writer) was always told as a young lad that the marks were those of St Patrick's fingers. The stone is from 5 to 6 ft [1.5-1.8m] in length & 2 to 3 ft [0.6-0.9m] high. I do not know how wide it is as it is built into the fence. The marks are somewhat like the following, all on the face but I could see without the ditch that there are some of top. They look like Bronze age markings’ (pers. comm. Joann Hinz; The Schools’ Collection, Volume 0535, Page 472; www.duchas.ie/en/cbes/5162112/5155297)"
I stumbled across a very interesting book on how Bunratty Castle and Folk Park became the tourist destination it is today by author Bernard Share titled "Bunratty: Rebirth of a Castle". From my reading it seems that to help mitigate the eventual removal of the enforced stop-over at Shannon Airport in the 1950s (which had been agreed in a bilateral agreement between Ireland and America in 1945). 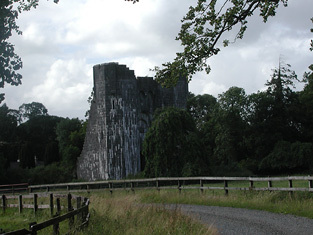 It was decided by Sean Lemass (who was then Minister of Industry and Commerce) that they should try to promote tourism further in the west around Shannon Airport and this happily coincided with the purchase of the castle by Lord Gort in 1953 and also the OPWs desire to protect the castle (which had been ongoing since the early 1900s). From there Lord Gort, who purchased the castle privately, was allowed to restore the castle with significant help from the OPW and eventually open it to the public. Later the idea of the banquet was added and finally the Folk Park was added on lands adjacent. Shannon Development was dissolved in 2014 and its assets are now operated by Shannon Group Plc. It is now Shannon Heritage (part of the Shannon Group) that operates the Bunratty Castle & Folk Park. One trustee each was to be nonimated by SFABCo, Bord Fáilte, the Trustees for the time being of the Furniture Trust and Aer Rianta, the State airports authority. 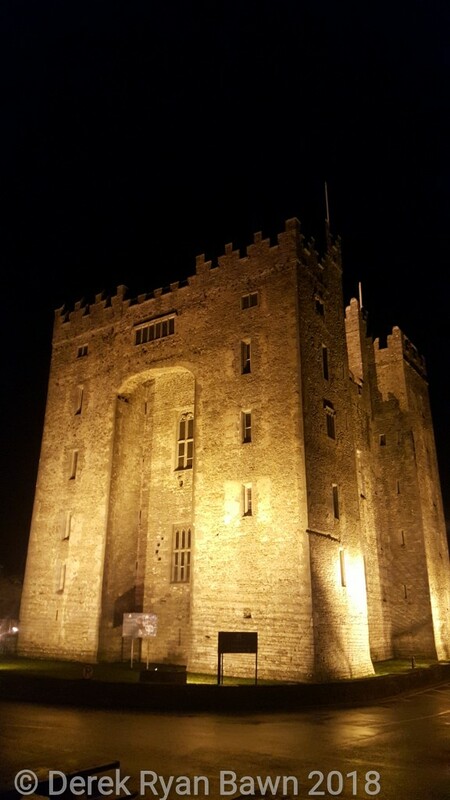 In the matter of management, the Trustees agreed to 'enter into a lease with the company (Shannon Development) whereby Bunratty Castle will be leased back to the Company. Under the terms of the agreement regulations regarding times and prices of admission were to continue to be made by the Commissioners of Public Works, subject to the approval of SFADCo and the trustees of the Furniture Trust. This latter, created by a deed dated 12 June 1959, had been altered and added to by a further deed dated 3 October 1967 made between the Commissioners of Charitable Donations and Bequests for Ireland - 'the ultimate owners', according to Peter Donnelly - and the trustees; the former body was now empowered to 'make any alteration to or variation of or additions to the presents' by the Building Trust. Lord Gort had, in a somewhat bizarre ceremony, immediately handed back Shannon Development's £10,000 cheque representing the purchase price of the castle to be applied to the Furniture Trust..."